Amazon has the DC Universe 10th Anniversary Collection, featuring 30 Blu Ray Movies on sale for just $98.99 (regularly $299.99). The films are based on or inspired by storylines and/or characters from within the ever-expanding DC Entertainment library. 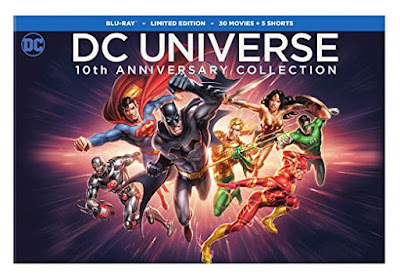 The stories range from films based upon classic DC comics/graphic novels (Superman Doomsday, Justice League: The New Frontier, Batman: The Dark Knight Returns, Batman: The Killing Joke) to films inspired by themes from within DC history (Batman vs. Robin was inspired by The Court of Owls series; Superman vs. The Elite was inspired by 'What's so Funny About Truth, Justice and the American Way?') to original stories (Justice League: Gods and Monsters, Batman and Harley Quinn).